Get Gorgeous Healthy Hair: The Must-Have Products. | Becky Alyssa's Beauty Box. 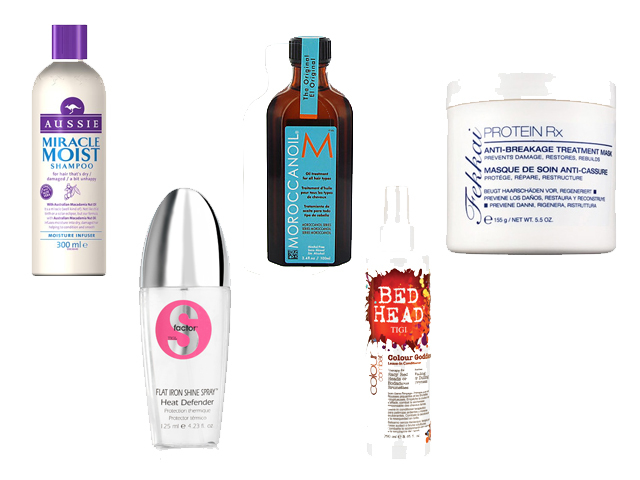 Get Gorgeous Healthy Hair: The Must-Have Products. Here is the 2nd part of my guide to Gorgeous, Healthy Hair – the products that will help you out a whole lot along the way! I’ve always been super-picky about what I use on my hair and always scour the internet for reviews to compare each so I know I’m (hopefully) not wasting my money. I’ve bought a lot of truly terrible hair products over the years (heat protection spray that literally fries your hair, anyone?) so here are my picks for products that will keep your hair healthy, lovely and looking stunning! 1. The Shampoo. If you’ve got dry, unmanageable hair, your best option is a moisturising shampoo to clean your hair all over whilst restoring some softness. My all-time favourite is Aussie Miracle Moist shampoo – it’s perfect for when I’m taking a break from dyeing my hair to get it looking healthy and feeling a little more naturally moisturised. 2. The Heat Protection. I used to straighten my hair every single day whilst using some pretty useless heat protection products, so of course I fried my hair and it took forever to grow out to an anywhere-near-healthy state. I wish I’d found the wonderful TIGI S-Factor Flat Iron Shine Spray sooner! It’s really a 3-in-1 product – it smoothes, adds shine and protects from heat. When I use it after washing, I find my hair looks naturally supermodel-like: shiny and smooth without straightening or meticulously blow-drying. Before I could never wear my hair in its naturally wavy state; now I can go out without touching my hair because this product does all the work. And if I do go out in the sun or need to straighten any annoying wavy bits, this product has it covered. And it smells like strawberries! The packaging feels a little cheap and plastic-y, but with any product that works this well, the packaging really doesn’t matter. 3. The Oil Treatment. Moroccan Oil isn’t the most popular cult hair care product for nothing: it helps hair feel luxuriously soft and silk-like without weighing it down or feeling greasy in the slightest. I currently use 2 pumps in my hands and then smooth down the ends of my hair after washing and towel-drying – those with shorter hair can get away with using less. The difference is amazing when you’ve never used this product before. Not to mention it smells divine..
4. The Conditioning Spray. I’ve always been a fan of conditioning spray to give hair that extra bit of softness before blow-drying. My favourite is TIGI Bed Head Colour Goddess – perfect for redheads or brunettes, as it won’t fade your colour. Truthfully it’s not an essential all the time, but it’s ideal when I’ve just coloured my hair and need to soften and detangle my dried-out, messy hair monster without fading the redness. 5. The Deep Treatment. When my hair’s hopelessly dried out, broken and in a sad mess, Fekkai Protein RX Anti-Breakage Treatment Mask is the product I’ll reach for. I’ve used it for years and it’s a must-have for anyone who abuses their hair with heated styling products or backcombing on a regular basis. It smoothes and conditions split and dried-out ends whilst restoring softness all over. I like to leave it on for at least half an hour before washing out and my hair feels beautiful afterwards as well as smelling like creamy sweet vanilla. I haven’t used it quite as much since I’ve been looking after my hair, but it’s always a comfort to have in the bathroom for whenever I need it! Have you ever used any of these? What are your favourite hair products? ← 10 Steps to Gorgeous, Healthy Hair..